The Japan Foundation is calling for application for its Hope and Dreams (HANDS) project for disaster education. Are you a university student or a young professional who care about disaster and education? Then this may be for you. sense of common feeling and coexistence as a community shared by the people of Asia, initiated by The Japan Foundation Asia Center. As a program, HANDs promotes dialogue and exchange among youth in Japan and Asian countries in order to deepen mutual understanding. HANDs also promotes the formation of a network among young leaders, as well as promotes collaborative efforts among them, in the field of intellectual dialogue on disaster education issues. The intellectual exchange through knowledge and experience sharing between Japan and Asian countries within HANDs Program will use a “two-way exchange” method, in which both sides seek to introduce and learn one another’s knowledge and experience. By using this method, we believe a new creativity of knowledge and values will be created, and then by sharing, a sense of common feeling and coexistence will be fostered among the people of Asia especially among youths. 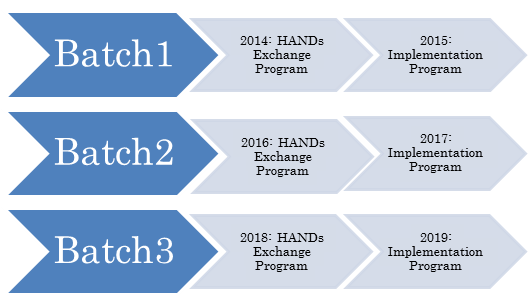 The HANDs program will connect youths, from Japan, Indonesia, the Philippines, Thailand, Malaysia and India. These youths, will be given a trip opportunity to learn about disaster education in Japan, Indonesia, the Philippines and Thailand also a chance to have collaboration to create a project for the community in the second year. The youths are the agents of change that determine what the future will be. In Asia, the wave of young people’s participation in giving social contribution is growing fast in various issue-areas, including disaster as one of the major issues faced in this region. With dreaming on a strong bond of friendships between Japan and Asian countries and hoping on the fast-growing youth participation, The Japan Foundation Asia Center provides opportunities for youths in Japan and Asian countries to learn from each other, to inspire one another and to seek for seeds for collaboration through HANDs Program. Therefore, within HANDs, the youth are not only expected to improve their personal development but also to take action, as symbolized in HANDs’ logo, small and colourful hands forming a bigger hand. The logo shows how youths from different economic development and socio cultural countries and with different background study and experience able to work together hand-in-hand, take action in tackling common issues. In the first year (2014), the selected participants will have an opportunity to do a study trip for 20 days to Indonesia, Philippines, Thailand and Japan to learn about disaster education in each country. The first trip, is scheduled to visit Indonesia and Philippines from September 25 – October 5 2014 (for 10 days), while the second trip is scheduled to visit Thailand and Japan in January/February 2015 (date TBC, for 10 days). For the second year (2015), the selected participants are expected to initiate a network of youths, university students and young professionals, focusing on disaster education related issues. Participants are encouraged to propose a new project on disaster education regarding topic of the year to the Japan Foundation Asia Center. In short, we are looking for participants who can 1) join the two trips a) from September 25 to October 5, 2014 and b) January to February, 2015 , and learn as much as you can and develop your idea, and 2) actually implement the best project ideas in the year of 2015 in your local communities. Please be reminded that this is not a mere study trip program, but more of an action-oriented program, in which you will be required to take action in the second year (2015). 2) a young professional (creative worker, social worker, journalist, and others) with at least one year of working experience. Applicants must have records of activities in the field of community building, including disaster and education in their home country, in helping disaster preparedness or post-disaster reconstruction including charitable fund-raising, or engaged in children, handicapped & elderly care, in deal with LGBT issues, women’s empowerment, and others. Applicants are eager to learn from other countries’ experiences of disaster preparedness and post-disaster recovery. Applicants must understand and agree to the aims of HANDs. Applicants must be bona fide citizens of Indonesia. Applicants have to be equal or under 30 years old, as of the date of application (August 13, 2014). Applicants must possess the ability to conduct formal conversation in English and a good communication skill. The whole program will be conducted in English language and participants must be able to fully participate with no translator. Applicants must be in good physical and mental conditions. What should I Prepare and Submit? - Two samples of recent works (in English or Bahasa Indonesia), for example poster designs, comics, product designs, photography, web design, short essays, newspaper articles, journals, video, etc. *The whole documents should not exceed 10MB, we will not accept documents larger than 10MB. For video files (if any), please upload to Youtube and send us the link. Where and when should I Send the Documents?